The practical Honeywell 8670 Bluetooth ring scanner is known for its flexibility and top performance. The lightweight miniature scanner captures nearly all common 1D and 2D barcodes quickly and reliably. Thanks to Adaptus 6.0 technology, excellent motion tolerance and enhanced decoding, the 8670 also captures poorly readable and damaged barcodes. 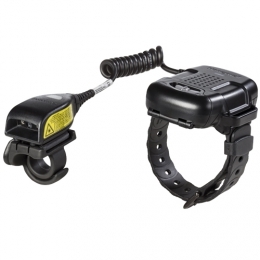 Its two-part design makes the powerful ring scanner particularly ergonomic when accompanied by the Bluetooth wristband module the miniature scanner offers more flexibility on your finger, a better weight distribution, plus it reduces user fatigue to a minimum - ideal for applications in warehouses, logistics and everywhere else where value is placed on hands-free operation. The 8670 supports all mobile and stationary devices with iOS, Android and Windows operating systems. Via simple, quick pairing the wireless scanner remains connected to the receiver at a distance up to 10 m. The integrated 750 mAh lithium ion battery gives users up to 10 hours of uninterrupted usage - more than a typical work shift.